Jose Mourinho's Manchester United lie an eye-watering 16 points behind leaders Manchester City after Matt Ritchie fired embattled Newcastle to their first home Premier League win since October. Life in the north-east has not been easy this season with problems off the pitch compounded by struggles on it, but Magpies boss Rafael Benitez oversaw a victory to cherish against old foe Mourinho on Sunday. Ritchie struck the decisive blow as relegation-threatened Newcastle picked up a much-needed 1-0 victory, digging deep to end an eight-match winless streak at St James' Park as Manchester United lost a second successive away game. Mourinho has now failed to win at St James' Park in all seven of his Premier League visits, while the result surely ends any residual hope of a late title push. Newcastle looked sharp from the outset and Chris Smalling somehow avoided giving away a penalty after up-ending Dwight Gayle - a let-off the visitors looked set to use as the platform to build an away win on. Alexis Sanchez was denied by a goal-line clearance just before the pendulum swung Newcastle's way, with a Jonjo Shelvey free-kick eventually played in for the unmarked Ritchie to rifle home. It was far from over as the visitors unleashed a deluge of attacks, but Benitez's men just managed to batten down the hatches. 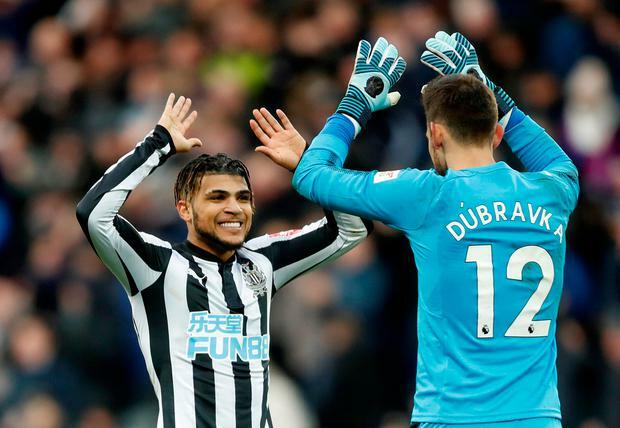 The St James' Park faithful roared their side on from the start on a crisp Tyneside afternoon, where David de Gea was called into action after just five minutes to superbly stop Shelvey's strike nestling in the top corner. Ayoze Perez fizzed a shot across the face of goal as the host began on the front foot, but Mourinho's men grew in confidence as the first half wore on and began to dominate possession. Newcastle goalkeeper Martin Dubravka was alert to deny Jesse Lingard's low, deflected effort when the Red Devils began to settle, with the imposing debutant doing better still when denying Anthony Martial one-on-one. Martial soon nodded wide as the visitors looked to go ahead, but it was far from one-way traffic. On-loan Kenedy got away a long-range attempt on De Gea's goal and Benitez was furious when referee Craig Pawson ignored Smalling's foul on Gayle in the corner of the area. It was a poor decision from the officials and Jamaal Lascelles' fine stoppage-time block perhaps prevented that from being compounded by a Romelu Lukaku opener. The Belgium striker did find the net early in the second half only for the goal to be disallowed, before Sanchez followed a mazy run with an attempt into the side-netting. The pair would combine superbly minutes later. Lukaku threaded a pass through to the Chilean, who skipped past Dubravka and took aim, only for Florian Lejeune to come out of nowhere to block. It proved the afternoon's turning point. Smalling was booked for simulation and Shelvey sent the resulting free-kick into the box. The ball was flicked onto Gayle, whose clever cutback found the unmarked Ritchie to strike into the bottom corner. Michael Carrick and Juan Mata came on immediately after the 65th-minute goal, which Ashley Young was prevented from equalising by Dubravka. Wave after wave of attacks from those in red threatened the Newcastle goal, with Martial denied by two last-ditch clearances in the 77th minute. Antonio Valencia was booked for a high foot on Christian Atsu as tension continued to bubble, with the home side digging deep as Manchester United's onslaught continued deep into stoppage time without a leveller.